A database was constructed for Angora goats to estimate energy requirements for maintenance, gain, and mohair fiber growth. 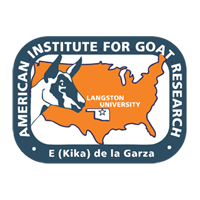 Treatment mean observations were classified into preweaning, growing, mature (not lactating or pregnant), lactating, and pregnant goats; however, due to limited numbers of observations, data for preweaning, lactating, and pregnant goats were removed. Data set 1 (n = 144) was used to estimate ME requirements for maintenance and whole body gain using simple linear regression analysis; data set 2 (n = 89) was employed to estimate ME requirements for maintenance, tissue gain, and mohair fiber growth using multiple regression analysis. Variables, scaled by kg BW0.75, were mean BW (kg), ME intake (MEI, kJ/d), ADG (g), ADG adjusted for grease fleece weight (adjADG, g), and clean fleece growth rate (CFGR, g/d); all variables in the regression analysis were Because of differences between growing and mature goats in intercepts and coefficients of simple and multiple regressions of MEI (P < 0.01 and < 0.08 for simple and multiple regressions, respectively), separate regressions were conducted. Linear, quadratic, and cubic effects of ADG on MEI for growing goats were not significant. The simple linear regression equation for mature goats was MEI = 527 (SE = 19.7) + 42.8 (SE = 4.98) × ADG [n = 79; R2 = 0.48]; after removing 11 observations with residuals greater than 1.5 times the residual standard deviation, the final equation was MEI = 496 (SE = 16.6) + 46.8 (SE = 4.06) × ADG [n = 68; R2 = 0.66]. The coefficient for CFGR in the multiple regression model for growing goats was not significant (P = 0.42). The multiple regression equation for mature goats was MEI = 469 (SE = 52.3) + 33.6 (SE = 7.15) × adjADG + 159 (SE = 55.1) × CFGR [n = 49; R2 = 0.45]. In conclusion, estimated ME requirements for maintenance of mature Angora goats were 469 and 496 kJ/kg BW0.75 and ME requirements for unadjusted and adjusted ADG and clean mohair growth were 46.8, 33.6, and 159 kJ/g, respectively.